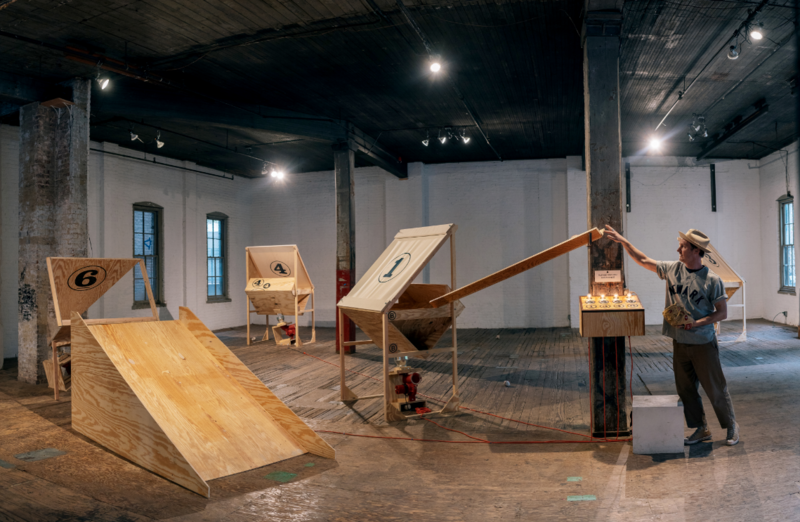 Chicago Athletic Association hotel is pleased to host a one-night-only exhibition of The Six-Four-Three Machine, making its way across the country. Stop into the Tank from 7-9pm for an up-close view, and to meet the men and women behind the installation. It performs a double play. Forever. In baseball, each fielding position has an assigned number: the pitcher is #1; the catcher #2; the first baseman #3… and so on. This way, each play can be described in specific shorthand. The Six Four Three Machine is a kinetic sculpture that perpetually repeats a 6-4-3 double play— a play where the ball is hit to the shortstop (position #6), who throws to the second baseman (position #4) for one out, and then to the first baseman (position #3) for another out. A series of catch-and throw stations, The Six Four Three Machine is an arrangement of parts that reproduces this occurrence, resets, and performs the act again. And again. And again.